Turkey Day is almost here! While you are thinking about all the things to be thankful for, we wanted to add a few to your list. We know you have a lot to plan for and things to do to entertain your guests. 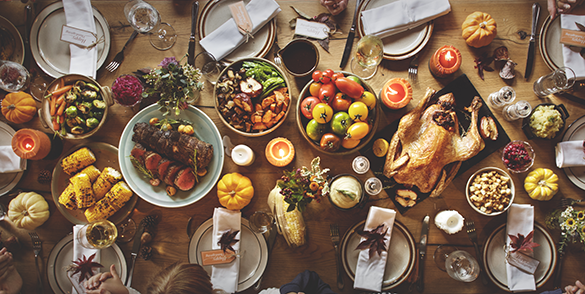 Here are the easiest Thanksgiving recipes to make the holiday less stressful and give more thanks for! We suggest making two batches to start…they won’t stick around long! Preheat oven to 325. Combine all ingredients in large mixing bowl. Grease baking sheet. Roll mixture into small balls and spread 2 inches apart on baking sheet. Bake 30 minutes until browned. No need to turn on the oven! Combine pumpkin, cream cheese, 1 cup of Cool Whip and powdered sugar in a bowl. Pour into pie crust. Top with remaining Cool Whip. Put in refrigerator to set for 4-6 hours. Done! It’s easy and tastes better to make it at home than buy the canned sauce! Take a saucepan over medium heat and combine orange juice, orange zest, sugar and 3/4 cup water. Stir until sugar is dissolved. Add cranberries and bring to boil. Reduce heat, let simmer until thick. Let cool before serving. Voila! Preheat oven to 375 degrees. Lightly grease at 9-inch baking dish. Combine cream cheese and butter in saucepan over medium heat. Add milk, corn, thyme and salt and pepper. Heat and stir well. Pour into baking dish, sprinkle cheese on top. Bake 15 minutes. Garnish with parsley flakes. Enjoy! We wish you a happy and safe Thanksgiving holiday with your family and friends! TT&E scrap yard will be closed Thanksgiving Day, November 23. We will be open normal business hours, Friday, November 24.